OVERLAND PARK, Kansas - August 26, 2015 - Bushnell®, an industry-leader in trail cameras and outdoor technology, has partnered with biologists at The Quality Deer Management Association and leading outdoor access technology developer Powederhook in the creation of a revolutionary new deer hunting tool. 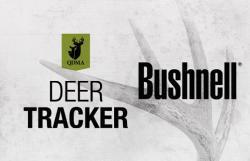 QDMA Deer Tracker allows hunters to submit reports based on observed deer activity or deer they harvest. Using this data, the app generates a heat map estimating the likelihood of seeing deer activity during hunting hours and within a selected area. Powderhook developed the app with collaboration from biologists at QDMA and teams at Bushnell, Cabela's and Hunting Lease Network. Designed with privacy in mind, Deer Tracker never reveals your exact location, yet crowd-sources a regional snapshot of deer activity that can be used to judge rut timing, feeding windows and optimum hunting periods. The app is available in the Apple App store and Google Play. Or visit www.deertrackerapp.com for more information. Bushnell is a brand of Vista Outdoor Inc., an outdoor sports and recreation company. For more information on Bushnell, go to www.bushnell.com.